2753 MAYER & MARRENZELLER IN WIEN. 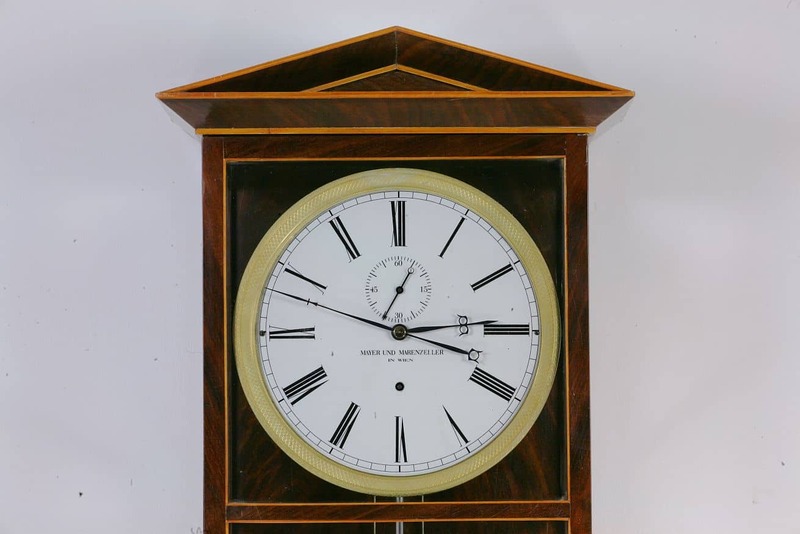 A SIX WEEKS DURATION SECONDS BEATING DACHLUHR IN A MAHOGANY CASE WITH A GRIDIRON PENDULUM. CIRCA 1845. A fine and elegant full length Dachluhr. 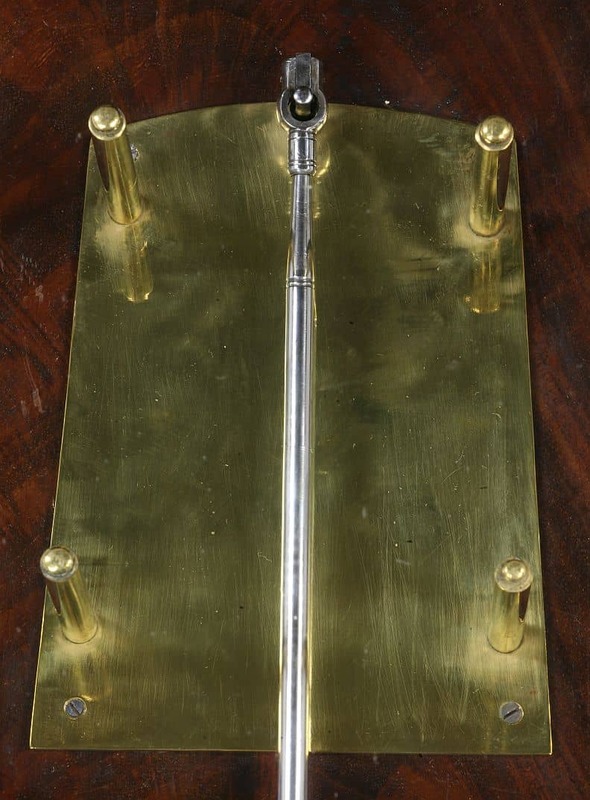 The mahogany and boxwood strung case of nine light construction has very fine carcase members to the door and to the sides, which gives the case a light and airy appearance. It has a typical pedimented roof with boxwood edging and the door and the sides have boxwood stringing to the glass. The door is a full length opening door. The veneers of the backboard are well chosen with fine flame graining. 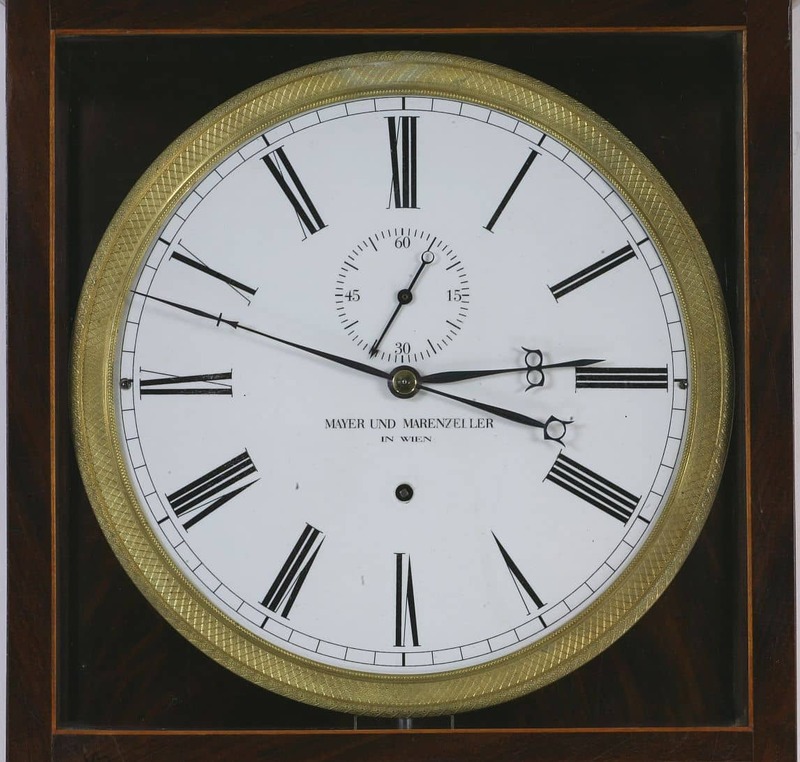 The enamel dial is signed for the makers ‘Mayer Und Marrenzeller in Wien’. It has blued steel hands, a seconds hand below XII and is contained within a finely cast and gilded engine turned bezel. The six week duration movement has Graham’s deadbeat escapement, fine wheel work and a five rod gridiron pendulum. Ignaz Marrenzeller is noted as working between 1831 and 1877. There is no record of his partnership with Mayer but it is believed this would be Wilhelm Mayer who was working from about 1845 to 1880.